Actually only Catholics call it that. But I knew it. Of course I knew it. At least I know it isn't what most people THINK it is. Ummm... is there a prize or anything? 'Cause this isn't really that much fun for free, Ken. It's not like the Catholic Church ever made a major effort to shine a light on its dogma. My recollection is that we were supposed to the parish priest's/bishop's/Pope's word for whatever, put money in the collection, and keep our mouths shut. I think I owned the misconception for 31 years... But I DO know that the moon is larger than en elephant, so whatever. If you didn't know enough about Mary, at least you know a little more about me. I also love cabbage. I would have made the same mistake you did. This just goes to show how little things get stuck in our minds and we just blindly accept these to be the truth. Well I had the same misconception. Interesting, I actually didn't know much about that. Wow! I am smart! I did know this. Not bad for a Protestant! I didn't learn this in church. I learned it in a history class! I had it right, but then I'm a librarian and owner of a thousand holy cards. I wonder if my kids know...not sure! And as one of them will be taking first communion very soon, I think I'll pass this on. But you're right, a lot of us don't know our religion very well at all, no matter what the religion is. I thought it was a pile of religious nonsense and it turns out it was. / the more you know! Yes, I feel like a dork now. And here I thought that I knew Christianity pretty well! Ah those Catholics and their silly terms and ideas! I had the usual misconception, but then, I am not a Catholic and such minutia should not really be considered common knowledge. Thank you all for engaging with this - I wasn't sure anyone would care to. Fragileheart: You *are* a tight little mixture of diverse cultures, aren't you? Ohio Real Estate: Can cabbage be loved? I like cabbage, that's about as far as I've gone with cabbage. To date anyway. Aywren: It *is* a head scratcher, isn't it? Penny: Bob didn't... he... oh God! Canucklehead: Don't come peddling your controversies over here mate!! Descartes: Wow, thanks for dropping by dude. I'm tempted to try a limerick about you just to prove that I know how to pronounce your name. Later, perhaps. Ken, yes, well it is the word conception in Italian... LOL, however, as teens we used to snigger behind our hands at Mom's first name, thank goodness we called her Mom! Bunch of clever cookies you got here than Ken. I had it all arse about face too... and I got all that 'good' old catholic 'edumacashun' and all too! Careful Ken, My Protestant cooties may rub off on you! My family is English and Welsh and my husband's is Irish. Makes for interesting conversations at family picnics! No blood has been shed yet! Sorry Ken, but I DID know - and I was Right. All I can say in my own defense is that I am not a Catholic, have never been a Catholic, and hope that that somehow explains me knowing it. I'm sorry but it just sounds stupid to me. Mary is the Immaculate Conception? No one is perfect or free of mistakes. As if the whole concept of hell were not enough. Stuff like this is why I didn't follow the standard religions. I don't want to step on anyone's religious/ spiritual toes but do you really worship this nonsense. AvidReader: NOW I need to know what the word conception is in Italian... hang on... ah... I see, (won't write to down for privacy. Hope: The plate is Fun! It beings out the best and worst in people. Reese: Don't worry some of my best friends are Protestant. Salt of the Earth!! Okay, I was also wrong in my thinking, apparently. Hahaha! 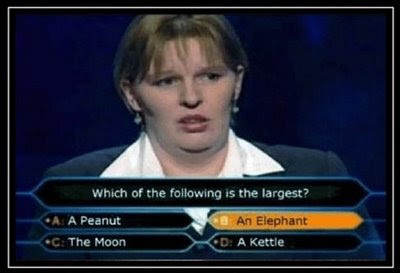 I got it right, even though I'm Jewish....but I can't believe that woman thought that an Elephant is bigger than the MOON! That cracked me up! Cheers mate! Max: You're on the wrong track, I will nip over and do you a verse, you can edit it out for crudity if you wish, I won't be mad. :) I would do it here but, come on, this is the Holy Mary post. I must behave. And now I know all about it. That was why when I went to college I wanted to find my own meaning of what religion is, I started finding no meaning in these religious rituals. I felt that being pious does not necessarily mean being good, that daily masses should find their way through our daily actions with other people-that it should be evident in the generous way we treat people. I think I'm finding the balance now...I surely hope so. Also not to be confused with the Immaculate Contraception, which was the name of the oft rinsed and re-used prophylactic device shared amongst the young men of Devizes during those lean years immediately following the end of the Great War.